When I was a little kid we drove north to Wisconsin to visit relatives almost every summer. The drive took us into the country. Corn fields, lakes, horses, cows. It was always an adventure. At some point the sweet scent of clover would fill the car. It was the smell of summer for me. To this day if I smell clover I flash back to hot wonderful Summer days in Wisconsin: swimming in the pond with my cousins, racing through corn fields (Not recommended! ), chasing horses in the field…..Summer. 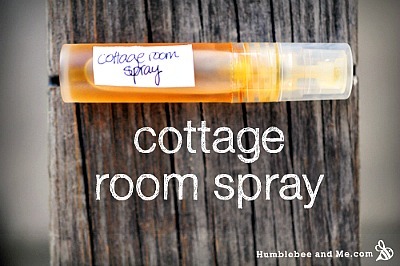 Marie of Humblebee & Me created this cottage room spray which brings the scent of her summer cottage with her anywhere. It’s the scent that helps her to remember summer days at the cottage. The recipe uses essential oils that evoke spruce and pine forests. Marie explains how to mix the spray. Click on the How to Make Homemade Cottage Room Spray link below to see the complete recipe.